Every occupation has it’s perks. If you’re friends with the bartender your drink gets poured with a heavy hand. A cop can get you out of a ticket. If you know someone in retail it’s a % off their merchandise. Heck, the governer gets helicopter rides to his kid’s sporting events. But, being related to someone in the fishing industry has its own rewards. Yesterday my cousin, Anthony, hooked me up with some fresher than fresh tuna steaks he caught while deep sea fishing. When I say fresh, I mean they were in my kitchen just hours after being pulled from the ocean. And in even less time I had them marinated, seared, and in our bellies! Thanks again, Ant! Rub the tuna steaks with a piece of ginger root, then discard. Pour soy sauce over steaks and let marinate in the fridge for about 30 minutes. Drizzle olive oil in a skillet and preheat til it is screaming hot. 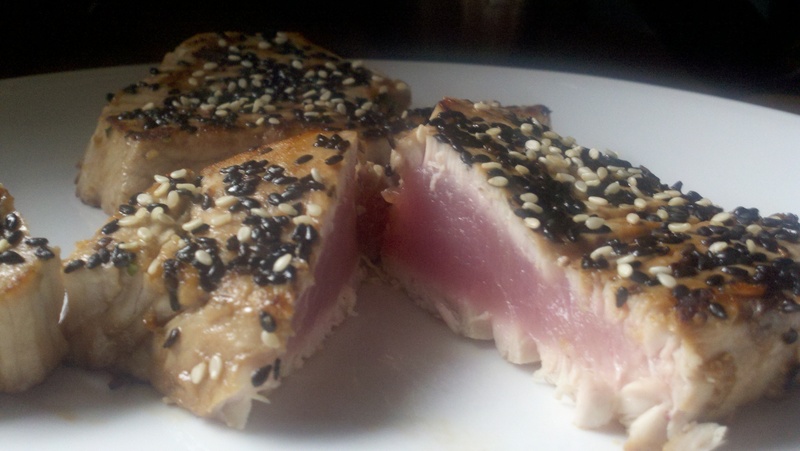 Sprinkle sesame seeds on both sides of tuna steaks. Place steaks in skillet and sear for literally less than 1 minute on each side, flipping only once. Serve steaks whole or sliced into strips.